The CON-TROL-CURE® DISKURE 365™ Radiometer is our most economical pass-through radiometer for measuring UV radiation levels in high intensity, high energy curing environments. It is a UV dose measuring instrument small enough (5.5" / 140 mm diameter x .5" / 13mm height) for use in most UV curing ovens. It is ideal to ensure quality control of printing and drying processes.A sensor on one side is exposed to the UV source and the other side contains a digital LCD which displays direct energy readings in mJ/ cm. Big size, heavy duty pass-through Integrator with a diameter of 140 mm. It is reliable and simple to use. The aluminum housing can withstand exposure to oven temperature as well as intense vibration and shock. 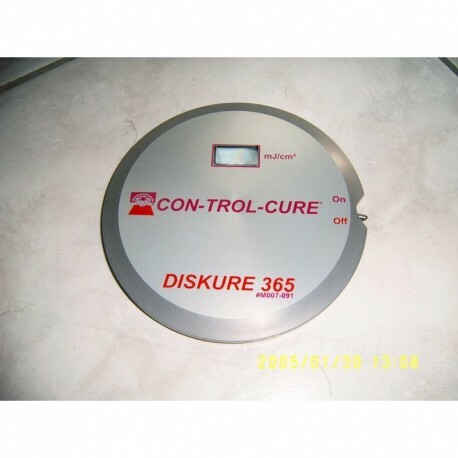 This durability makes the DISKURE 365™ ideal for measuring UV light energy in harsher environments such as photosensitive resist exposure systems, processing equipment, print plate exposure systems and most UV curing ovens. Special filters and photodiodes absorb the visible as well as the IR portion of the light, so that measurements are made only on the required spectral region. After exposure, the radiometers LCD shows the total UV measured in mJ/cm to which the unit was exposed.